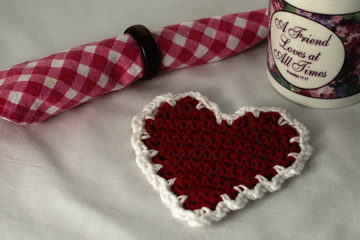 Do you love crocheting with FREE patterns? Everybody loves a bargain and I’m no exception! When the pattern is FREE, that leaves more money in our budgets to purchase the yarn or crochet thread for the projects we’re going to make! I’ve designed some FREE crochet patterns over the past few years and I thought I’d share photos, as well as links, to my FREE patterns that are available on the internet. It’s my Christmas/Holiday gift to YOU! I hope you enjoy these FREE patterns!!! 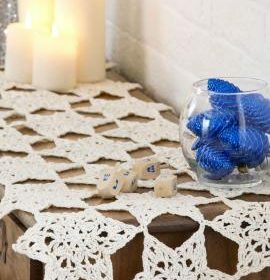 This table runner is made with 4 balls of Aunt Lydia’s Fashion Crochet Thread, size 3 in #926 Bridal White, or in any color of your choice. It is made with a total of 28 stars (join-as-you-go) and measures 15” x 50”, but can be made longer or shorter, if desired. The pattern includes written instructions, symbol crochet charts and an assembly diagram. If you are new to thread crochet, size 3 crochet thread isn’t as “intimidating” as size 10 (or smaller) crochet thread! For free Star Table Runner pattern, click here. 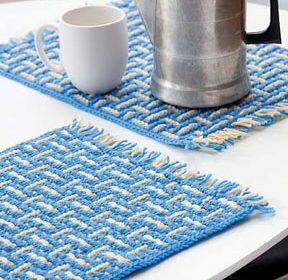 This placemat is made with Red Heart Super Saver yarn in #885 Delft and #320 Cornmeal, or any colors of your choice. Each placemat measures 13” x 19” (including the fringe) and 1 skein of each color will yield many placemats! These placemats are made in the mosaic crochet technique of working into previous rows to make the vertical lines of the basketweave design. The rows alternate back and forth between the light and dark colors. There are no ends to weave in because the ends form the fringe on the 2 side edges. Who doesn’t love a project with no ends to weave in? What a time-saver!!! For free Mosaic Basketweave Placemat pattern, click here. 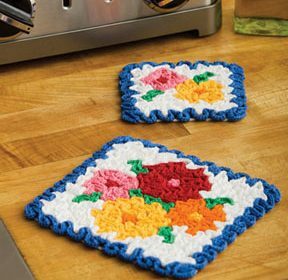 This hot pad and coaster set is made with 7 colors of Aunt Lydia’s Classic Crochet Thread, size 10. The hot pad measures 6” x 5.5” and the coaster measures 4” x 3.75”. They are made in the Wiggly Crochet technique of making a foundation mesh for the base of the piece, then adding the wiggly crochet stitches on one side of the base to make the design on top (the flowers, leaves, edging and white background). The pattern includes written instructions and 2 wiggly crochet charts. Wiggly Crochet projects have thickness, making them ideal for hot pads, rugs and more! 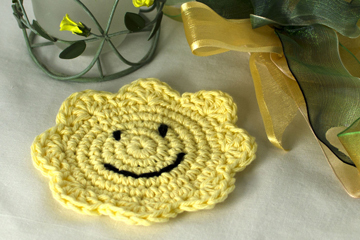 For free May Flowers Hot Pad & Coaster pattern, click here. 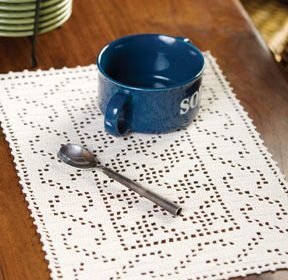 This placemat is made with 1 ball of Aunt Lydia’s Classic Crochet Thread, size 10 in #226 Natural. It measures 11.5” x 19.5” and is made in the filet crochet technique with open and closed mesh. The pattern includes written instructions and a filet crochet chart. For free Celtic Placemat pattern, click here. This blanket is made with 6 colors of Caron Simply Soft Light yarn. It measures 36” x 47.5” and is made in the filet crochet technique. The pattern includes written instructions, a filet crochet chart and an assembly diagram. If you’re not a fan of using crochet thread, you’ll love making this blanket in the filet crochet technique with yarn instead! For free Starlight Baby Blanket pattern, click here. This sweater/tunic is made with Naturally Caron Spa yarn. The pattern comes in 3 sizes: S/M, L/1X and 2X/3X and is made with motifs set on point, joining as you go for no seaming! The pattern includes written instructions, as well as symbol crochet charts and schematics for each size. This is one of the few garments I’ve designed!!! For an extra chart showing how to join 4 motifs, visit the Ravelry page for this design here. For free Sorrel River Sweater pattern, click here. This scarf is made with Naturally Caron Spa yarn. It measures 12” x 54” and is made in the filet crochet technique. The pattern includes written instructions and a filet crochet chart. This is another filet crochet project made with yarn instead of crochet thread! For free Europa Scarf pattern, click here. This wrap is made with Naturally Caron Spa yarn in #0008 Misty Taupe and #0007 Naturally for exceptional drape. It measures 66” x 18” and is made in the Bruges Lace technique with 33 join-as-you-go motifs. The pattern includes written instructions and an assembly diagram. If you love Bruges Lace, or simply want to try Bruges Lace, give this free pattern a try! For free Vail Mountain Wrap pattern, click here. These baby booties work up quickly with sport weight yarn. They measure approx. 3” long and are worked from the sole up to the top edge. There is an optional drawstring added near the top to help keep the booties on the baby’s foot! 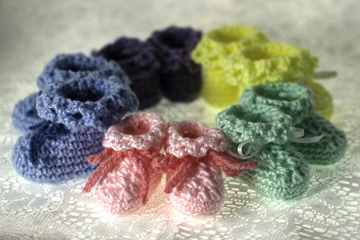 These are smaller than many baby booties, making them perfect for preemies and hospitals! This coaster is made with worsted weight cotton yarn. It measures 4.75” x 5” and is worked in rows of red, then edged with white. It is a great pattern for learning to make increases and decreases. This coaster is made with worsted weight cotton yarn. It measures 4.75” diameter and is worked in rounds from the center to the outer edge. The face is embroidered on after the coaster is crocheted. It is a great pattern for learning to work in the round. To download the PDF files for these free patterns (from The Crochet Architect), just visit the “Free Patterns” page here. I hope you enjoy all of these FREE patterns, courtesy of The Crochet Architect, Coats & Clark and Caron!!! I’d love to see photos of your finished projects made with these FREE patterns linked to my designer page on Ravelry. If you’re not already a member of Ravelry, check it out. It’s a FREE website for knitters and crocheters to share their projects, look for new projects, communicate with other knitters/crocheters and get inspired by each other! I hope you’ll give some of these crochet techniques a try (Filet Crochet, Mosaic Crochet, Wiggly Crochet and Bruges Lace). They’re a lot of fun to learn and to make! May you have a very Merry Christmas, Happy Holidays, Happy Hanukkah, etc. This entry was posted in Crochet patterns, Crochet technique, Free crochet patterns and tagged crochet, filet crochet, free patterns, patterns. Bookmark the permalink.